Welcome @Members to the 8th round of our Hotlap Championship. The goal is simple, set your fastest time using the in-game time-trial mode, with the car and track combo posted. If you're like not a setup wizard then you can opt to use one of the default presets (loose, stable or OEM - where available) as we'll be running separate divisions for open and default setups. If you've previously set a time on this combo and you are unable to beat it, please take a screenshot before leaving the session or your time will be excluded. If you are taking part in the Default Setup division and are unable to beat a time you have previously set on a Custom Setup, then you must record video evidence to prove your time was set on default or your time will NOT be included for the round. You can only set a time in one division, custom OR default, per round - your time will be taken from the leaderboards at the end of the month, so please do not try and beat your own default setup time with a custom setup (or vice versa), until the month has ended and the results have been posted. If you are taking part in the 'default' division, you must select an in-built default preset, do NOT match a custom setup to the in-game defaults. We will be using the SMS leaderboards to verify the times and setups used. The track limits will be defined by the in-game limits, not "Two wheels within the white lines". If those limits seem too loose or too tight, drive your lap accordingly. We will not be reviewing laps unless they are suspiciously fast. Good luck and have fun, because fun is what this is all about! @Members , this should be a time-trial you can all enjoy! There's some stiff competition at the top of the world leaderboards but let's show them who's boss. Have at it! Sorry I missed the last TT challenge.. being a setup noob I needed all my time for the Revolution Cup 6. 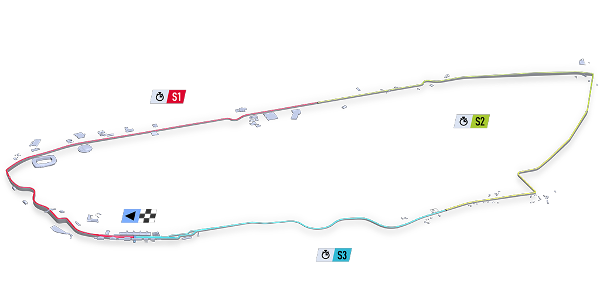 Will try this one for sure...new circuit to me so getting to know the track for future races will be my main goal. Nice combo, but the default setup is not gonna be competitive here. Time to copy/paste. Hi guys. I've posted a time some days ago for the specified combo but I'm not seeing it in the rankings. Is there something I should do? "And did you exchange, A walk on part in the war, For a lead role in a cage?" (Pink Floyd). Wow, i can this TT going to be the one that breaks me. I got a few days off coming up.